Look at those knife switches on the front of that rig on the left - Manual antenna changeover? Matching it with pictures in the 1998 AWA Review indicate that it is a National R-115 AC/DC Coast Guard receiver which was first manufactured about 1940. Here's a list of Type Accepted gear (all radiotelegraph) from the 1940 FCC Annual Report. However, in another place in the report it is indicated that a survey showed that 20 companies were making radiotelephone gear of 80 different types with prices from $99.50 to $2450. Certainly Lorain Electronics (and its predecessors) was a very strong supplier of shipboard gear on the Great Lakes and to a lesser extent (?) on the rivers. RCA or RMCA (Radiomarine Corp of America) was another leader in the ship-to-shore field. 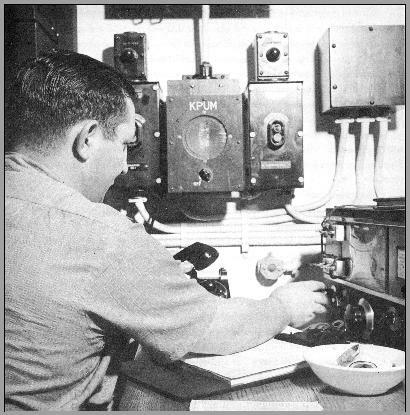 Other names associated with shipboard radio gear were Mackay, R. F. Communications, Northern Radio, and Raytheon. When SSB came into use around 1980 ICOM equipment became popular on the Great Lakes boats and CAI gear was used by some of the stations. Which of these were most common on the lakes and rivers? Were there significant others? Pictures of the most common gear are requested. Lorain Electronics - Many good images here. Hallicrafters - Some good info./images here. RMCA - Not much here yet. Mackay-ITT - Nothing here yet. Northern Radio - Nothing here yet. RF Communications - Nothing here yet. Hopefully, we will have some history as well as pictures of equipment and its shipboard installation for each of the companies. While I don't have any information about Marconi Marine gear Jerry Proc, VE3FAB has some pictures of a Marconi Rx and TX (at the bottom of the page) on his web site which also has other marine radio gear images and information including the HMCS HAIDA's radio rooms tour which shows lots of marine radio gear, much of it made by Marconi. This Chum Bucket page has information and images on radios designed for use on yachts. The same site also has a Radio Direction Finder page. The, lost-in-history, L. R. Dooley Co. of NYC manufactured the rare, R-138 US Coast Guard receiver. The best information received so far indicates that during the HF radiotelephone era there was only one emission type change (AM to SSB) 1977-9. I know that all my early listening (1947 to 1956) was AM and that my Drake TR-7 was purchased in the early 1980s at least partly because all the marine stations were then using SSB and I had no other way to receive them. The multiple-tone ringer system was a significant invention - selective calling of each boat. Somewhat equivalent to a boat having its own phone number. It kept much static and other traffic out of the pilot house. 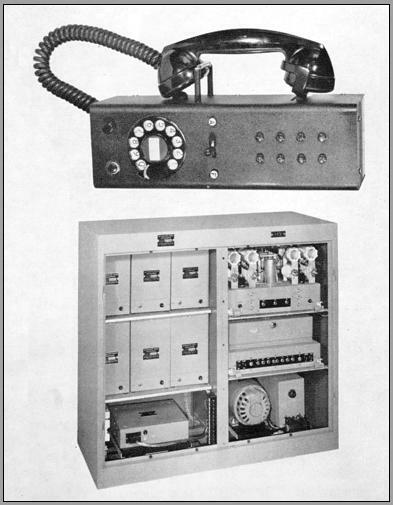 Information in the Hallicrafters HT-8 instruction book indicates that there was an external Western Electric Model 104A ringer option for that rig in 1939. Therefore, though RCA mentions a ringer in their 1951 ad, it appears that they were not the pioneers here. Were the ringers later integrated into the transceivers? Who else manufactured them, and who assigned the ringer numbers? How many ringer numbers could be assigned without any duplication? Thomas Drake provides some answers to these questions on his recollections page. A 1941 FCC document indicates that both Lorain and RMCA had selective calling options for their shipboard gear and that it was the norm on the Great Lakes at that time. It's a big step from 1951 in the previous paragraph to 2006, but most ships today are required to have an AIS (Automatic Identification System) that uses existing VHF channels. All ships on Great Lakes and St. Laurence Sea Way must have this equipment since it automates the VTS (Vessel Traffic System).